Thank you very much for your comments, I am looking forward to learning more about Bairactar.Here are some pictures of 2 year old Judals Marafia. Wow!Can only imagine how gorgeous she will be at 5-7 years of age. Now that is a filly that fully lives up to the pedigree. You must be over the moon! Amistad is one of those that should have the best conditioner/trainer that money can buy and be re-evaluated after about 3 months of work. With that pedigree and a proper program he would be a lot of fun to show! How old is he? PS- His tail female goes through the Murray owned but Crabbet Bred Risira. I happen to have correspondence from Lady W to Mrs. Murray and she was constantly from the late '30's to the 50's trying to buy Risira back! 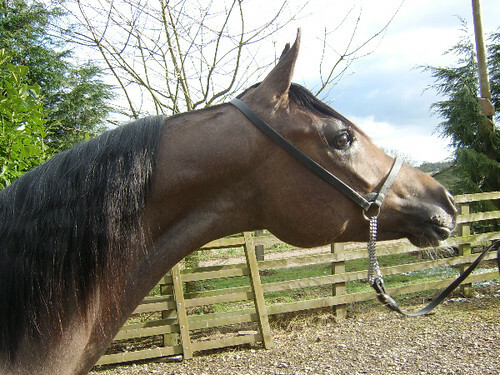 He is 8 years old and unshown to date, he has taken along time to mature and didnt want to bring him out before he was ready. He lives with me and I think of him as my baby, but he is not owned by me. I want to be able to learn as much as I can so we can do the very best for him. Could you recommend anything that I should be reading and learning about? Eventually I want to find a mare to breed to him with so I can have my own Amistad baby. You mention about tapping into Naziri properly how can I learn how to do this correctly and what type of mare should I be looking for to compliment him. Sorry for so many questions I just want to learn as much as I can and really appreciate any help given. Wow Taylor, your boy is gorgeous!!! The picture is lovely. Thank you so much for sharing. Ooops...posted the above before I saw your post Fee. Will have to go back and look up your mare! Aha! The wonderous Polianka. The resulting foal would be more robust but quite nice as well. Very good idea! What charachteristics would a Kohejlan-Moradi have or does anyone know where I can find out about this strain or is it a sub strain? Thanks Egbert have been trying to figure their strains out for ages!! So again (sorry to pester) is Satin Moth Russain, Polish and Crabbet? and is Avalon mostly Egyptian and a splosh of crabbet? Could you tell me roughly what % Egyptian at all? Also as I hope to breed him when he is old enough what blood lines will complement his? Thank you ever so much am dashing about looking for those books mentioned and spend every spare minute researching what I've learnt so far. Also you said on a quick glance they were good pedigrees but I'm facsinated to know what are the good bits so I can look them up easier? so much information and not enough hours in the day to digest it all could any one recommend a book on straight egyptians and how I can tell looking at a pedigree if a horse is a SE. I would like to bred from her purely to get a foal to keep for myself and was told I should do this before she is 10 (she is 5 now). Unfortunatly the stallion recommended died suddenly at a young age, also sadly June died eairler this year, so I do not have her expertise to suggest an alternative so where do I start? Anne, I have seen Taraneh on several occasions and also know/knew her dam & granddam. Unfortunately, although I can remember liking Taraneh's head, I can't recall the rest of her in detail, as June had several grey fillies around that time and they were always out together! June was a great believer in the 'grandparent theory' - ie, that the parents of the parents should be studied closely as their characteristics are more likely to emerge in a future foal - and I have to say, she was right more often than not! As Taraneh's mother was somewhat short in the neck, I would suggest you look for a stallion that not only has a good length of neck but also a nice arch to it, and clean underneath. Also you should look for one that has a good back end, as EH Gasira had the rather short and steep croup typical of a lot of Gharib offspring. No doubt Mike will have some suggestions as to individual horses - I have to confess, seeing so many SEs that are lacking in good fronts put me off these lines some years back (although I was one of the early enthusiasts), so I have not been studying recent horses as closely as perhaps I should. I do know June went to look at Joan Woodward's new boy, and was planning to visit Annette Hedley to look at her recent import shortly before she died, if that is any help as to her thoughts on her next move for her SE lines. Hi Egbert, i was wondering if you could help me with my fillys breeding and whot is her strain. Im fasinated with your knowledge and would be most happy if you could tell me about my fillys breeding. If you go to all breeds peddigrie and type in my fillys name Zahkira there are two edited, please click on top entry and you will see my girls bloodlines. She is an GR AMARETTO FILLY. Look forward to hearing from you thanx.TERESA. Thanks again Egbert, you really are a wealth of knowledge and im extremely grateful of your help. I will try and look out for the book you mention. Thanks Fee for your nice compliment. On paper do you think she looks like a nice wife for Frazer? Combining the Carmargue with El shaklan aswell. Like I said this is just for fun and I understand that its not just whats in the pedigree that counts. Thank you so much this sort of information is great for a total novice like me. It was Joan Woodward's Ansata Alghazzali she was planning to put Tara to obviously that is not to be so. I spoke to Mrs. Woodward and she did say she had recently got an other Ansata Stallion is this the one you mean I don't know what his name is or seen a photo? I must admit I am not into showing, I am more a jumping riding person and June thought Tara would be ideal which although due to having surgery in early spring (me not Tara)and not being able to do as much with her as I had hoped this year. She is turning out to be a lovely ride.. I plan to breed my filly in the future, would be really honoured if you would look at her pedigree and suggest some crosses. Have been doing a bit more research and have come across something that has left me a little confused. Is it right in saying the spelling of the strain changes depending on male or female? So becasue Frazer is male he is Kuhaylan'Ajuz Rodan but if he was female he would be described as Kuhaylah Ajuz Rodaniyah ? Sapphire...Ok as I remember I would say your horses are mostly Crabbet with Polish/Russian for Moth and Crabbet with Egyptian for Avalon. My GUESS is both horses have over 50% Crabbet blood. Anne, IMHO the best book on straight Egyptians is the CLASSIC ARABIAN HORSE by Forbis (you might try Ebay and Amazon for a copy.) but think it has been out of print for quite some time. -same as Ali Jamaal-and the dam line traces to the popular El Dahma. My suspicion is that your girl must be exceptionally beautiful...as the lines that are not 'straight' are via the beauteous Ffatal Attraction whose composition is amongst the greatest of American and European breeding programs: El Shaklan, Khemosabi, Bay Abi. So your filly's strain is Dahman Shawan. Would love to see a picture if you have a chance. Taylor, Moallalaurie would work very well, though not a Seglawi which is what I'd like you to find first...But the powerful beauty that Mustaphah could bring would be there. She is a Hadban Enzahi going back to the Davenport desert import, Hadba. A line that is not powerful but cooperative...It picks ups the best qualities of whomever she is bred to. Maureen, if Mustaphah is still around he would be good for your girl, as would FS Bengali. 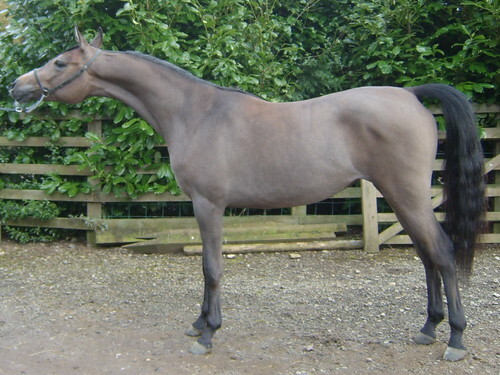 You have a Kuhailan Rodania line filly of wonderful quality-especially the presence of Makor on the dam's side but she is fairly heavily Kuhailan bred and I'd like to see her outcrossed to an excellent Seglawi line stallion such as those previously mentioned. But PLEASE, you too should keep your eye out for a great stallion that speaks to your heart first and foremost...knowing the pedigree only acts as a guide. Can't stress that enough folks...The most important part of the horse is what you see and how the animal behaves...A great pedigree is a bonus but can be meaningless unless reflected in the horse itself. Yes Taylor, she is the one Ross Esta malika, I dont have many pix of her but what I have, I will happily show you, lyndafree@talktalk.net .e mail me and I will reply with pix, I dont know if you know but I sold her a few years back and have just bought her back in a terrible state, she is now looking great and she is going on loan to Nicky Knapper, for her to have a crimbo baby I know she will be well looked after there and then she can come home forever , I will never sell her again , she did not deserve to be treated so badly and I promised her she will never want again, poor little begger panicks when it is feeding time, I think she is worried she wont get fed, . what I feel about how she was treated words can not explain, they had this wonderful mare and starved her, thank god I was able to buy her back, but what upsets me is that , this woman still has Malikas daughter and will NOT sell her back ! Thanks egbert, a brilliant summary of my girls bloodlines, very intresting and thanx for telling me her strain. My emil address is teresaroger1965@hotmail.com. Can you please send me your email address and i will send you photo. Teresa. Oh how terrible Lynda, the poor little girl I can only imagine how you must have felt and to know they still have her daughter too Im glad you managed to get her back and you can feel happy in the fact she will never be treated the same way again. Lucky Nicky I bet she is very excited about her baby I Will email you now becasue I am dying to see pictures. I love this thread, fascinating. Volume 20 of the AHS Sutd Book has recently been printed, this is also a very interesting mine of information, difficult to put down! And, in the section on broodmares, the strain of each one is given. But PLEASE, you too should keep your eye out for a great stallion that speaks to your heart first and foremost...knowing the pedigree only acts as a guide. Egbert, i agree with you wholeheartedly with these comments. With the best will in the world, if the horses being considered aren't good 'specimens' to start with, you might end up with not a very good Arabian horse and just a piece of paper. Please, and I am sure Egbert will agree, look at your horses first and analyse them phenotypically. And most definitely, then add pedigree knowledge that Egbert is providing wonderfully that is an excellent and important tool to help achieve the best end result to have a great foal. Thank you Egbert, Just love FS Bengali he's lush, here's hoping! Hi Vygoda, I have taken your comments on board and would get my filly evaluated by an expert before any covering. Have to say though my Vet says she oozes quality. Once again thanks Egbert for sharing.